Project Connect is an ambitious effort to revitalize more than 1,400 acres in the North St. Louis Neighborhood under the direction of the St. Louis Redevelopment Corporation (SLDC). EPS was retained as part of a project team to conduct a market study as input to the redevelopment plan and to develop a financial model for testing infrastructure financing alternatives and strategies for catalyzing development in this distressed area of the city. 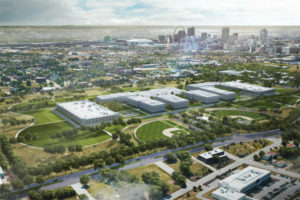 The redevelopment strategy is centered around the recently approved relocation of the National Geospatial Agency (NGA) to a 99-acre site in the center of the Project Connect district creating 3,110 high paying jobs that will in turn spin off opportunities for additional commercial and residential development. EPS first completed a market analysis to identify the type and density of residential and commercial development products and supportable pricing and absorption. Successful national and local infill development projects were evaluated to identify key essential community elements and investment strategies for attracting new development and building momentum for reinvestment. EPS worked with the project design team to determine the best locations for an initial phase of development, required infrastructure investments, and recommended development program. Several development alternatives with differing location and development programs were created for comparison and testing. EPS then developed a financial model to cost and revenues for each alternative and to estimate potential tax increment revenues for application to eligible capital needs. The consultant team worked with SLDC to refine the preferred development plan and to identify additional funding sources and financing strategies for implementing the initial phase of infrastructure for the redevelopment plan.